Future Security Systems, the leading commercial and domestic security specialists serving Bath, Bristol, Somerset and Wiltshire, are committed to keeping residences and businesses in Midsomer Norton safe from burglars. The busy former mining town of Midsomer Norton, just a few miles south west of Bath, is in the heart of the area covered by Future Security’s operations, and the company is in demand there for efficiently supplying, installing and maintaining intruder alarms in the busy trading estates and retail outlets as well as private homes. Studies have shown that properties with an alarm system are three times less likely to be burgled. This is because the obvious presence of an alarm acts as a deterrent, but experience has shown that the only way that an intruder alarm can be truly effective is if it is correctly used, maintained and preferably monitored. Future Security Systems advises those with a burglar alarm in Midsomer Norton that the best choice of alarm, particularly for commercial premises, is one that not only emits a loud noise and flashing lights if triggered by an intruder, but one that is also connected remotely to a local alarm response centre. Alarm Response Centres give you the comfort of knowing that your intruder alarm is monitored 24 hours a day, every day. If a burglar sets off your alarm in Midsomer Norton an activation signal is received by the centre, which will then check to ensure the alarm was not triggered by accident and if it appears to be a genuine intrusion the emergency services or a designated person will be contacted on your behalf. Future Security Systems can supply, install and set up a good quality wired or wireless alarm to cover your property in Midsomer Norton, and if you are willing to pay a service fee we will connect it to the nearest approved alarm response centre. A less expensive option is to install a “bells only” audible alarm which emits a loud noise if its motion detectors are activated. This can be effective if you have neighbours who will contact you or the emergency services if they hear the alarm go off, but it may not be sufficient to meet the requirements of your insurer. If you’re not sure which type of alarm system would best suit your business or domestic property in Midsomer Norton, consult with the professional Future Security Systems team who will ensure you are equipped with the most reliable, up to date alarm that meets British and European standards. We also offer extremely affordable burglar alarm maintenance contracts in Midsomer Norton, which include an annual check and competitive prices for any necessary repair work. Future Security Systems is approved as a Which? 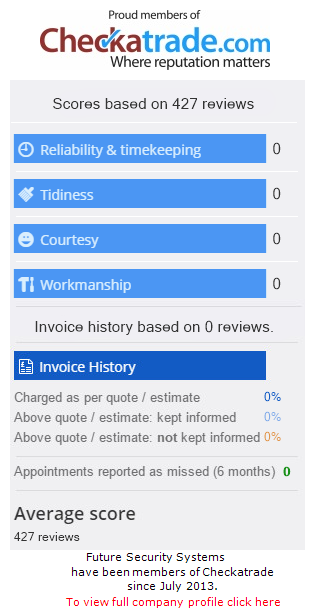 Trusted Trader and are high scoring members of Checkatrade.com. We are also certified by the SSAIB (Security Systems and Alarms Inspection Board) – the leading certification body for organisations providing security systems and services. If you’re looking to protect your home or business in Midsomer Norton, contact Future Security Systems Ltd today to discuss your requirements.